If any of those newspapers cover your area, keep an eye out for the Hank story in them (one installment per week)! 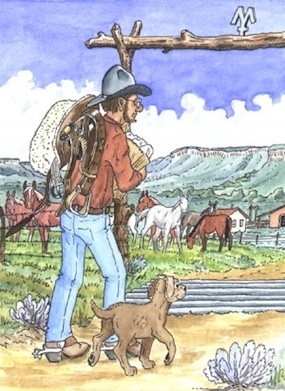 And, if you represent or know of a paper that would like to carry one of the Hank the Cowdog Serial Stories, please email us at hank@hankthecowdog.com for details about how to do that. The Homeless Pooch: Read the story of how Hank and Slim meet and come to work on the ranch. The Watermelon Patch Mystery: When Slim discovers Sally May’s watermelon patch has been raided by raccoons, Slim, Drover, and Hank (mostly Hank) are entrusted with the job of a nighttime stakeout to catch the raccoons in the act. The Kitty Cheater: After Hank lures Pete the Barncat into making a foolish bet for scraps, would Pete try to cheat the Head of Ranch Security? The Runaway Windmill: Things really take a wild and windy turn when Hank and Drover go with Slim to help oil the windmills on the ranch. The Cookie Moon:Hank accidentally gets loaded in Loper and Sally May’s car that also contains a picnic basket with...you guessed it: oatmeal cookies! Will Hank be able to resist the temptation or will he actually find out that Sally May packed the picnic just for him? The Dancing Cowboy: On the eve of a big dance, Miss Viola’s pickup breaks down in front of Slim’s house, and she needs Slim’s expert help as a mechanic. Will the bachelor cowboy take the opportunity to ask her to the dance or will the Head of Ranch Security have to take her to the dance? The Valentine's Day Robbery: It's Valentine's Day, and Slim goes to town (with the dogs, of course) to buy a nice box of candy for Miss Viola. But on the way to Viola’s house, Hank and Drover take an interest in the candy and...will there be a Happy Valentine’s Day on the ranch? These stories, which have not been released in book form, are also available in Hank's Store as "Audio Only" Story CDs.